A team of US researchers at Harvard has developed a simple rubber device composed of two pieces of rubber replicating the 'vocal tract' and a motor that replicates the action of a contracting muscle. 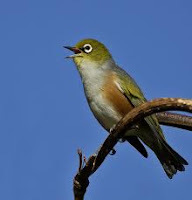 With this device, the researchers have been able to EXACTLY mimic the birdsong of a variety of species including the bengalese finches and vireos. Given complex birdsongs have been faithfully reproduced with such a rudimentary device as shown here, it does suggest that complex neurologically processes are NOT required. In reality, physics is all that is needed with just a little brain power. You can listen to samples of birdsongs produced by the device here (halfway down the page). If birdsongs can be replicated with such a simple device, just maybe, better vocal cord devices can be created for humans who have lost the ability to produce a clear voice. Humans can lose the ability to talk/sing clearly due to cancer, papillomas, scarring, paralysis, etc. Although research on vocal cords is active, I'm not aware of any projects pursuing complete replacement with a biological equivalent of the rubber band. In fact... I'm not aware of any research project being pursued to create the biologic rubber band in the first place. If you read any textbooks describing the vocal cords, it does seem mind-numbingly complex which perhaps explains why researchers have been discouraged from pursuing this line of inquiry. But, if it can be done for birdsongs whose vocal cords are anatomically similar to humans, than theoretically, a simple rubber band device can also be created mimic-ing the human voice. This does sound like a fun high school science project the more I think about it. Once that has been achieved, the physical characteristics of this rubber band can be broken down and than replicated by biochemists to create a biologic equivalent (or biologically inert) rubber band which can than be transplanted into a human with a damaged vocal cord. Just a thought that I am sure is easier said than done. Read the full article in the BBC here. Research paper on this topic to be published in near future.